I know how that feels – I’ve been there. to think more clearly and be able to concentrate better? to sleep better and feel less tired? to feel calmer and happier? to have flashes of brilliant inspiration? to have life fall into place and feel less of an effort – to get more done in less time? to calm your mind and tame your Inner Critic? All of these – and many more – are benefits of a daily meditation practice. And you don’t have to disappear off into a cave and pretend to be a yogi, sitting for days on end, before you notice the effects. As little as ten minutes a day of meditation can make a huge difference – when you know how. When you’re flat empty and out of charge, ten minutes of the right kind of meditation can have as much benefit as a couple of hours of cat nap. When you’re managing a business, having enough energy is vital. And meditation doesn’t bring with it the same post-rush-crashes as caffeine or sugar. Taking ten minutes out of a hectic day to meditate can give you hours back in additional creative time. It lowers your risk of heart disease. Researchers (yes, the ones with lab coats, not the long-bearded hippies) have proven that meditation can strengthen your heart, lower your blood pressure and lower your risk of heart disease. Not convinced? Meditation helps you to feel less stressed. It triggers the body’s relaxation response, which neutralises the cortisol and adrenalin that would otherwise keep you feeling totally stressed-out. AND it also helps you to spot your stress triggers and habits, so you can consciously choose to deal with them. Feeling less stressed means it’s easier to concentrate, meaning you’ll get more done in less time. It helps you to worry less. Regular meditation helps you to let go of your Monkey Mind’s stories. It’s not about making your mind goes silent – instead it’s about reclaiming your power to choose which thoughts and stories to feed. This reduces worrying and anxiety, whilst also helping you to feel more relaxed and to trust that things will be ok. Letting go of worrying and anxiety opens the door for inspiration and business success. By cutting your stress and worry levels, and focussing on balancing your body’s relaxation vs ‘fight or flight’ responses, meditation helps you to feel less angry and irritable. It’s so much easier to inspire people to share your vision when you lift their spirits, just by being there. It’s the perfect antidote to ‘fog-brain’. Fuzzy thinking is one of the biggest causes of business mistakes – and procrastination. By learning how to calm your mind (and there are even specific techniques that will do this for you!) you find that the clarity you need for managing a brilliant business is readily available to you. Just imagine how being able to think more clearly could help you to implement your business visions. When you’re regularly taking time out to sit with ‘who you really are’, rather than the stories your Monkey Mind is telling you, then you’ll deepen your connection with your Inner Wisdom and intuition. That will lead to flashes of inspiration on how to solve problems – or dive into a market gap you would never otherwise have spotted. A single flash of inspiration could be worth thousands to your business. It’s a rare business beast that isn’t running some kind of Inner Critic. And your Inner Critic is the part of you that means you lash out when you’re feeling threatened or stressed or insecure or worried – and you self-sabotage your success at the 11th hour – or you don’t even start that dream project. It’s essential for entrepreneurs and business managers to deal with their Inner Critic in a healthy way – and meditation is one of the most effective and empowering tools for this. Just imagine how much braver and bolder you would be in your business if you had dealt with your Inner Critic and felt fearless in your choices. When you learn to observe your Monkey Mind, rather than dance with its drama, you can set yourself free from its stories. This helps you to practise discernment – telling the difference between what is Truth and what is ‘tantrum’. When you can calm your mind enough to do this, you’re no longer at the whim of your mind’s soap opera and seeing straight to the Truth of a problem becomes one of your greatest skills. Just imagine being able to do this in a tricky business negotiation? By being happier, calmer, less stressed and less worried, your relationships will automatically improve. And it’s not just at home. You’ll be more patient with your work colleagues and your upbeat focus can even the performance of the people in your team. The shift you make from living in your head to living in your heart is contagious – it inspires people to become the best person they can and it can even dramatically increase customer loyalty. Just imagine the impact the changes you make in yourself could have on your family – and on your staff morale – and on your customers. 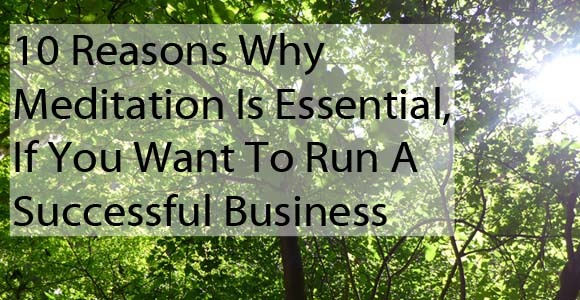 And we’re just scratching the surface of the benefits with this list! Surely all of that is worth ten minutes a day of your time? Launching on September 1st 2014, this six week online course is specially designed for business managers and entrepreneurs. It brings you the ‘how to’ of meditation and mindfulness. But it also dives into an inspired blend of modern psychology and Ancient Wisdom, to make creating the daily habit easy. You’ll get to deal with the excuses, blocks and myths that might otherwise get in the way. It’s a gorgeous combo of videos, workbooks, MP3 audios and moral support in our private Facebook group. And it’s all designed in bite-sized chunks that mean you can fit it in, easily, no matter how busy your schedule is. If you can find 10-15 minutes a day, then you’ll get the full benefits. And there’s a special VIP launch offer that you won’t want to miss. I’m curious: are you a reluctant meditator, who is still in the ‘should’ zone? Or are you ROCKIN’ your business with a daily Zen-like habit? 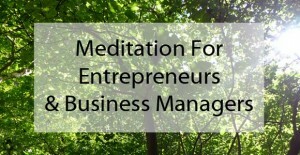 How has meditation helped your business? And what would you like to know about how to get it to work for you? Please let me know, via the comments – I’d LOVE to hear from you!